Thanks for viewing this file. Please read mod description. There'll be an update soon to adjust some textures. Whats the difference between your version and the one included in zzjay's mod? 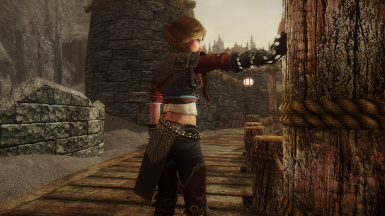 http://www.nexusmods.com/skyrim/mods/69007/? Except for the chain-mail pattern they're basically the same. There are a few differences. The "white" under shirt that I have compared to zzjay's is a completely different mesh. 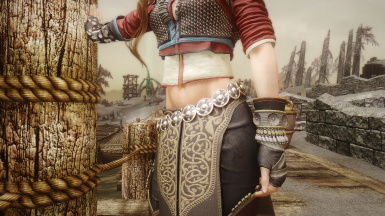 Neither are the original mesh for the Witcher outfit as it was a physics mesh that could not be extracted. 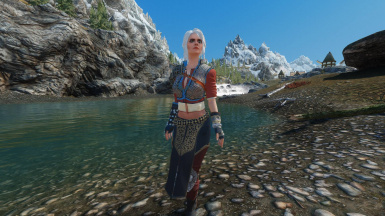 I'm not exactly sure what mesh zzjay used, but mine is from another Ciri Witcher 3 outfit, fitted and re-textured to look and fit like the original game mesh including the length and shape as it was presented in game with her DLC armor. 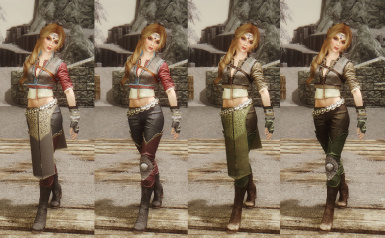 My mod also has colour variations, and two versions of the base outfit: one with the skirt panels and one without. We also weighted the meshes differently for animations. I wouldn't say the conversion fits we did are the same either. There are subtle differences to the shape. 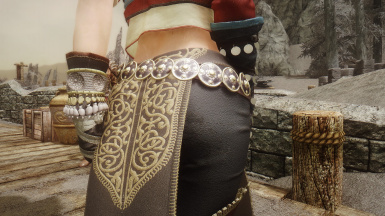 The original version I had released last year of the Ciri DLC features a skirt panel I made myself before the actual skirt panels were available. 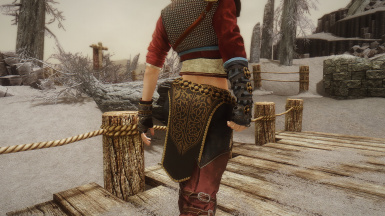 This was I converted for the Levionte TW3 Ciri Follower. It's what he included with her follower package. Thanks for the answer; just gonna have to try them in game to see which I prefer. Endorsing when allowed. 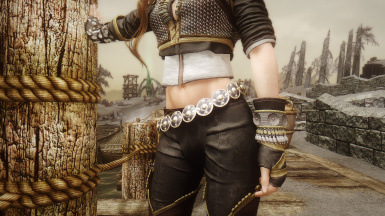 Besides the color choices (your original is brighter) and chainmail pattern, everything else is pretty much the same. So far haven't had any bugs with yours (cant say the same for the other mod), so I'm keeping it. Endorsed. Love! this armor. Sent a pic your way - my char really likes it. Very cool! I can't wait to try it out. The first person view of the Gray gloves, are wrong, they have the colors of the Aqua gloves. Can I easily fix this? I have a texture update I need to complete in the next week. I'll address the gloves with the update. Thanks for letting me knows about it. No problem of course. Much appreciated. STOP making exclusive mods for Oldrim. Need MORE mods for >>SE<<. Please, port this mod. This particular mod is ready to use in SSE out of the box. So go wild. I'm not planning on making official ports for awhile. But this one will work as is. I have no plans to start on SSE until some time after the new year. It will come eventually, just have to be patient. I could already port it successfull. Please let him do it, i need this. Im using it right now on SSE but im not sure if its safe..make it official on sse. 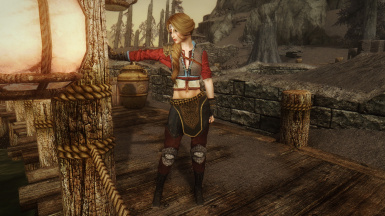 I will be handling ports of my armor/clothing mods to SSE myself in due time. Right now I am working on custom dialogues for seven followers and that is my priority. 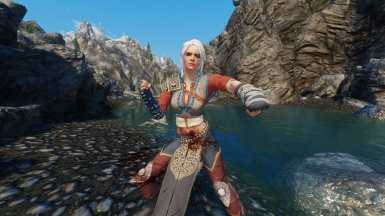 This version of the Ciri DLC should work in SSE. Levi set it up that way until I have time to do an official SSE upload of it. Well, that shouldn't happen. And since you are the only one to report this I would assume you have a conflicting mod or too many armor mods for your menu system to cycle through. 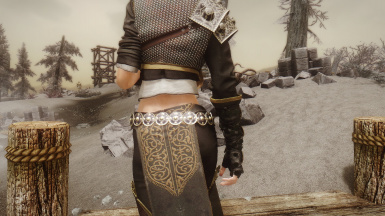 If you have another Ciri armor installed with a similar name it could be a possible conflict. Check your load order and verify you have nothing with a similar name. It's all I can speculate at this point. Also, which body conversion are you using? 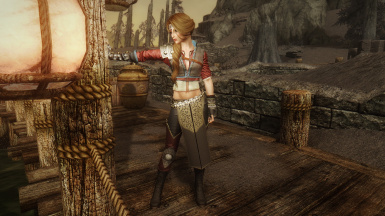 You may have a model conflict if you are using the wrong conversion on your NPC's body. Typically this only causes crashes when you equip the item, but anything is possible when you have mod conflicts. Very nicely done. Super cute and easy to make.